Bert was the Coach of the United States Equestrian Team from 1955-1980. 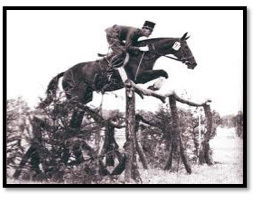 Bertalan de Nemethy began his career as an officer in the Hungarian Cavalry and as a member of the Hungarian Olympic Jumping Team. After World War II he immigrated to the United States, where he became the coach of the United States Equestrian Team, a post he held from 1955 to 1980. He led the team to sustained international triumph in 6 Olympics, 5 Pan American Games, 4 World Championships, and countless international horse shows. Teams coached by de Nemethy scored victories in 144 Nations Cups, while his individual riders won no fewer than 72 international Grand Prix, 44 Championships, and hundreds of individual classes all over the world! After coaching the U.S. Team, de Nemethy was much sought-after as a course designer. He was inducted into the Show Jumping Hall of Fame in 1987. His book, The de Nemethy Method was first published in 1988.